HK is a union for commercial and clerical employees in Denmark. With over 275,000 members, it’s the biggest union for salaried employees in Denmark. HK had started a two year business plan around creating awareness of the facilities available to help and guide members when deciding the next step in their careers. To help achieve this HK hosts a large content hub on their website with career tools and guides available for both members and non-members alike. Many of the different tools and guides on the website weren't being utilized, but why? We found many Danes did not prioritize or didn’t feel like they had time to think about, or contemplate the direction of their careers. People are simply too occupied with everything from grocery shopping, to raising kids and going to the gym to worry about how to develop their work life. However, this lack of time, in terms of thinking about their careers, wasn’t because it they felt it wasn’t important - on the contrary it meant a lot to people. In the first three months, over 14.000 visitors came to the campaign page with over 3.000 people booking a meeting with themselves. HK saw an 81% increase in traffic to their online career tools in the same period. 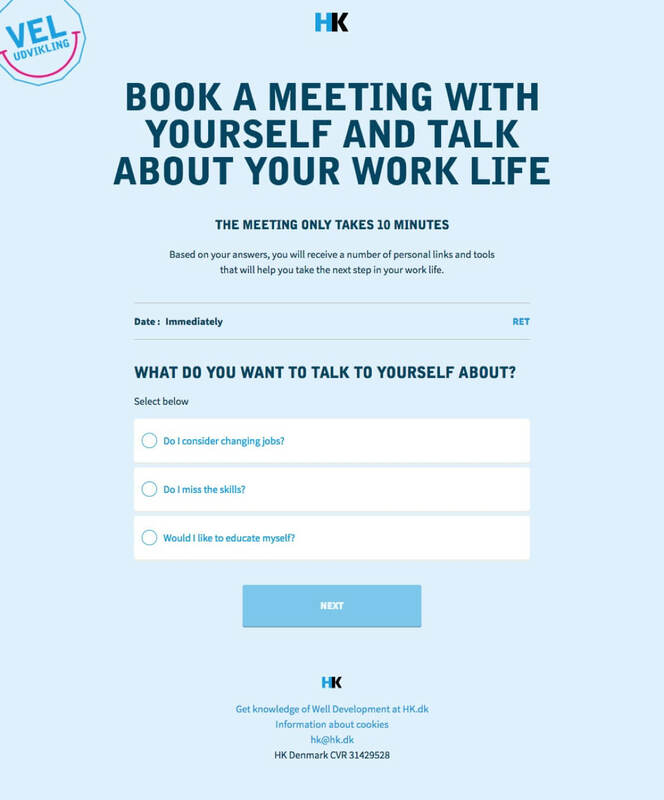 The goal of the campaign was to create a platform that would allow people to take time out of their lives to think about the next steps in their careers, and show them that HK can help with these steps. 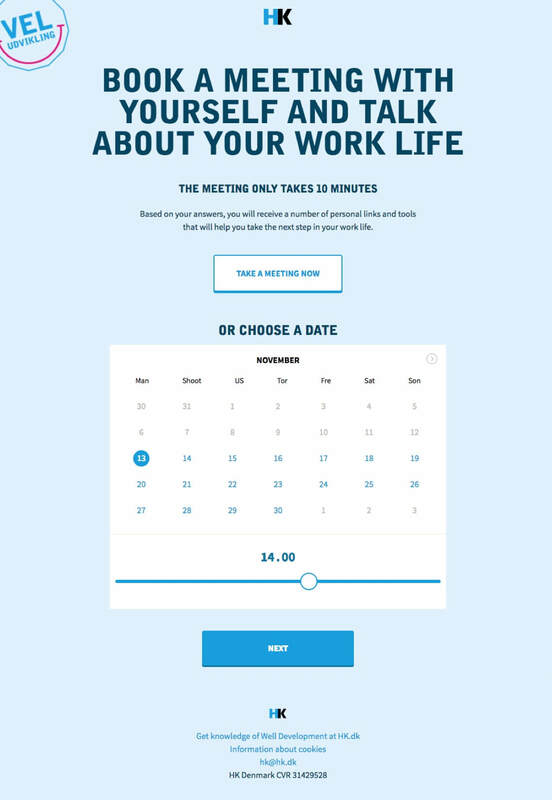 The solution was a tool that allowed users to plan a meeting with themselves in the future. The meeting would be saved to the user’s calendar and would consist of a selection of carefully curated questions within a user defined area of concern. The questions were designed to allow the users to contemplate and to detail their thoughts, concerns and considerations. At the end of this private meeting (for the user’s eyes only) it allowed HK to offer their assistance and showcase the guides and tools available. From the answers to the questions, a selection of tailored options, suggestions and next steps were presented to users. The users could then pick those that interested them and send to themselves.